First Sentence: I don’t remember hearing an explosion. Reason for Reading: Although this book was on my radar to a small degree, it especially became my target when I read a couple of comments made my online book friends, both of whom couldn’t finish the book because it was too depressing. What does that say about me? Ha! Despite that, I was drawn to the topic of the book, wanting to understand how and why someone would chose to be a suicide bomber, especially in today’s society when it seems like there is another bombing every day. From the Publisher : Dr. Amin Jaafari, an Arab-Israeli citizen, is a surgeon at a hospital in Tel Aviv. Dedicated to his work, respected and admired by his colleagues and community, he represents integration at its most successful. He has learned to live with the violence and chaos that plague his city, and on the night of a deadly bombing in a local restaurant, he works tirelessly to help the shocked and shattered patients brought to the emergency room. But this night of turmoil and death takes a horrifying personal turn. His wife's body is found among the dead, with massive injuries, the police coldly announce, typical of those found on the bodies of fundamentalist suicide bombers. As evidence mounts that his wife, Sihem, was responsible for the catastrophic bombing, Dr. Jaafari is torn between cherished memories of their years together and the inescapable realization that the beautiful, intelligent, thoroughly modern woman he loved had a life far removed from the comfortable, assimilated existence they shared. Dr. Amin Jaafari had no idea what his wife had planned nor any idea she had been involved with any terrorist organization. He believed he and his wife were happy. He was successful in his career and widely respected in the community. It came as an utter shock that his wife may have felt differently. So when Amin discovers what his wife has done, he is determined to find out why. Where did he fail? Did she try to give him a sign that she was unhappy and he did not see it? Yasmina Khadra takes readers into the mind of Amin as he struggles with denial, anger, grief, and the need to know why. There is so much I want to write about this book and yet I do not know where to begin or how to put my thoughts into words. The subject matter is so pertinent to what is going on in the world today in the Middle East and elsewhere around the world. 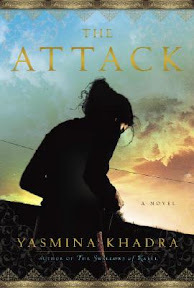 The Attack is a powerful and intensely emotional book that offers readers into a mindset so little understood by those in the Western World. I came away from this book being reminded that no good will come from all the violence. It’s a never ending cycle—everyone blaming everyone else. I don’t know where it started, whose to blame, only that now everyone is at fault for some infraction . . . The answer, the solution, isn’t violence. Favorite Part: My favorite part of the book was the conversation between Zeev and Amin. Zeev is the kind of person I think it would be fun to sit and converse with. He was a refreshing character in a very disturbing book. Dr. Amin was very lucky that he had such loyal and supportive friends around him during such a difficult time. I admired how they stuck by him and tried to help him through it all despite what his wife had done. Miscellaneous: Author Yasmina Khadra is a psuedonym for Mohammed Moulessehoul, an exiled Algerian writer.